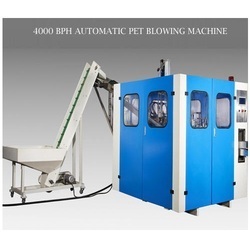 Providing you the best range of semi automatic pet blowing machines, fully automatic pet blowing machine, 4000 bph automatic pet blowing machine, 4000 bph pet blowing machine, automatic stretch pet blowing machine and pet blow molding machine with effective & timely delivery. We had simplified the technology of the Semi Automatic Pet Blow Molding Machines which will help our buyer to use and maintain on his own . 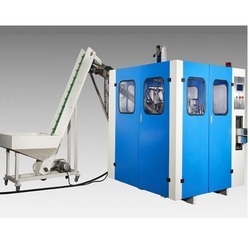 These automatic pet blow molding machines are used in manufacturing pet bottles, pet jars, plastic bottles, plastic jar, mineral water bottles and mineral water jars. 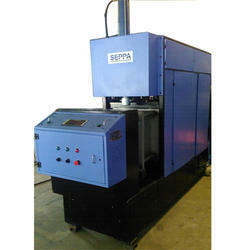 We are counted among the prominent manufacturer and exporter of 4000 BPH PET Blowing Machine. The equipment offered by us is manufactured in accordance with the international quality standards using high grade raw material, which is sourced from the certified vendors of the market. Our efficient quality inspectors check these products on various parameters to ensure the durability. The PET bottle is a great success in many countries. They give you the super crystal clarity needed to show any product to advantage. They have excellent carbonation retention properties and a good barrier to oxygen. Extremely resistant to breakage, light to handle and transport, and safe to health and environment. To the advantage of PET itself, the extraordinary Characteristics of the Canadian Clear PET Bottle Blowing machines are added simplicity, compactness, reliability and flexibility. Quickly installed, the machine is ready for producing bottles of various shapes and contents as the changing of the moulds are rapid. Renowned for these advantages, it is the small two steps machine which is the most sold in world and gives satisfaction to hundreds of producers for various different applications like mineral water, carbonated Soft drink project equipment, edible oil, detergents. 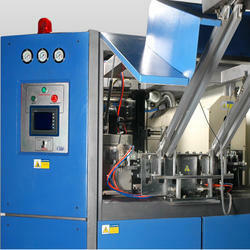 This is an ideal system for economical production in small series of quality bottles. Multipurpose Infrared Rotary Heater: Six to eight vertically horizontally and angularly adjustable double lamps can be turned to allow a more uniform heating of any type of preforms. Before blowing preheating is achieved by recirculation of hot air exhausted by lamps and the system automatically adjusts to changes in the ambient temperature. An oven with ten lamps (optional) permits the heating of thicker preforms. An oven with 24 lamps permits the heating of 20 litre bottle preform. The control cabinet is equipped with a programmable microprocessor with Error Status Indicator. Setting and adjusting of the controls can be performed manually. For special climates the cabinet can be air conditioned. Easy Access : The pneumatic, hydraulic and electrical equipment, as well as the cooling system, are easily accessible. 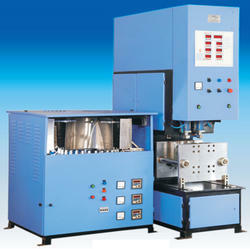 Minimum replacement time is required when one type of bottle mould is changed for another one. No special tools are needed. The bi-axial orientation: PET is certainly the ideal material. But to retain that title, it also needs the full benefits of bi-axial orientation. Bi-axial orientation requires two-stage production: the perform is first produced and then, within a precise temperature range, it is stretched both axially, (thanks to stretching rods), and radially by blowing. It is this process which gives the container its strength. 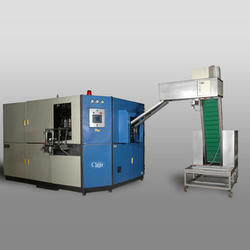 These two phases can be carried out on one double acting machine (one stage) or separately on two different machines (two stages). But the new generation of applications is covering a still more extensive range of detergents and cleaning products, wines and other alcoholic drinks, fruits juices, certain conserves sauces, ketchup and mustard, cosmetic and pharmaceutical products, industrial paints and oils chemical products etc.